AppSec Europe 2017 will be held in Belfast’s premier conference venue, The Waterfront Hall, located in the bustling heart of Belfast city centre and close to all transport hubs. Large registration and welcome foyer, including coat check and luggage storage area. Multiple activity track rooms holding up to 200 delegates. So called ‘Hallway Track’ rooms, bookable by delegates on the conference days for ad-hoc presentations or conversations. Green rooms and press rooms for speakers. Smaller meeting rooms for OWASP members. Two exterior terraces allowing delegates scenic views of Belfast and the river Lagan. 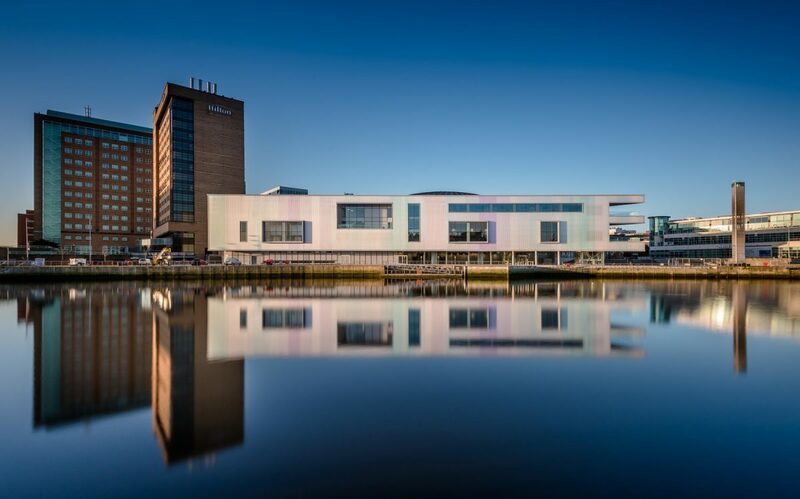 Offering visitors a panoramic 360 degree view of Belfast, the Waterfront is perched on the banks of the River Lagan, on which the city of Belfast was originally founded. The Waterfront Hall is adjoined to the Hilton Hotel, our main accommodation partner.